Managing employee productivity is a critical element of ensuring efficiency in the workplace. Making certain that employees are keeping their commitment to the responsibilities they signed up for is another major component of future success. An employee attendance tracker can help business owners and office managers stay on top of the comings and goings of their staff. This easy-to-read and operate attendance tracker will keep an accurate record of who is in the office, who is out of the office and why they aren’t there. The employee attendance template is just one of the hundreds of instantly downloadable and completely complimentary templates, calculators and spreadsheets available on this site. 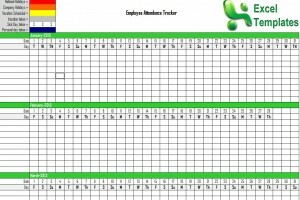 As constructed, the employee attendance template was created to keep track of a total of nine workers. However, the beauty of an Excel template is that it can be customized however you wish. No matter how many employees you need to monitor, this template will most assuredly meet your needs. Every single day on the 2013 calendar has a spot on the employee attendance template. The tracker begins in January and runs all the way through New Year’s Eve 2013. Each month containing all the days in it has its own respective section in the template. To properly use the template, you must next input the names of all your employees for each respective month. Once this is complete, if an employee misses time for one of the aforementioned reasons, you will simply color stamp the box for the corresponding day. For example, if all of your employees will have Christmas Day off this year, scroll down to December 25th on the template and color stamp the entire column red. If someone has a vacation day scheduled for September 1st, stamp the box yellow until the day has passed, at which time you would re-stamp the box grey.